jewellery inspection, decreased vision or diminished eye sight. Stock for this item is not available. Features: 12.5 cm Glass lens (round). Magnification is rated at 2.2 times or 5 dioptre. 22 watt round Fluorescent globe. Lens has a protection cover. Bracket handle on lamp head for easy adjustment. Electrical specification - 240 volts, 50 Hz, 22 watt. Warranty cover for one year. Related selection to help decide. 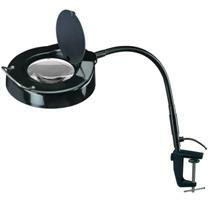 Beauty Salon Magnifier Lamp with 5 dioptre Lighted Magnifying Glass. This Desk Lamp has a weight of 3.25 kg, diameter of the Glass Magnifying lens is 12.5 cm, uses a 22 watt Bulb and operates through an electronic ballast. A metal Table mount is included. Arm is made from metal and has an overall length of 123 cm. LED Magnifying Lamps for Desk, Bench or Table. LED Light comes from 108 diodes and the Magnifying Glass is a 2.25 times Magnifier. Professional Magnifier Table Lamp with LED Light. 90 LED Lights are set in a ring pattern around the Magnifying Glass Lens. This Lighted Magnifier can be optionally turned into a Floor Lamp. Black Lamp mount for Desk (Screws not included). Can organise delivery of any of our Magnifying Lamps throughout Australia. Online payments processed through PayPal - MasterCard and Visa accepted. Cheque or bank transfer also allowed. Call (02) 6162 1950 for more details or email us. * Selection of Desk top, Clamp and Floor Lamp models with Light. * Full Magnifier Desk Lamp range can be demonstrated in store.